Cranberry Spinach Salad is a different recipe. Its easy to make in a short duration and and very tasty. You can try this and after eating it you will definitely feel making it again. 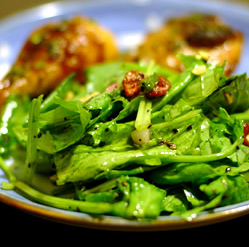 The recipe for the light weighted, juicy and healthy salad is here. 1. Take a medium saucepan, melt the butter over it on medium heat. Cook and stir almonds in butter until its lightly toasted. Remove from heat, and let it cool. 2. Now take the large bowl, combine the spinach with the toasted almonds and cranberries. 3. Now again in a medium bowl, whisk together all the other ingredients together like the sesame seeds, poppy seeds, sugar, onion, paprika, white wine vinegar, cider vinegar, and vegetable oil. Toss with spinach just before serving. You can also use Craisins and only 1/4 cup sugar. light olive oil instead of vegetable oil and sesame seeds and almonds toasted in the oven at 350for 10 minutes to cut out the butter. Also add gorganzola cheese.